3D-printed objects can be connected to the Internet without electronics or batteries. Researchers at the University of Washington have come up with something seemingly impossible. They have found a way to print objects in 3D and then connect them to the Internet and other objects without their own Wi-Fi or batteries, creating, in effect, 'talking objects'. The University of Washington News reports that the research team, led by Vikram Iyer, Justin Chan and Shyamnath Gollakota, wanted to create a way for people to 3D-print something right at home using available plastic raw materials, and be able to use the creation almost immediately. It's all about small sensors, switches and gears. "Our goal is to 3D-print wireless sensors, input widgets and objects that can communicate with smartphones and other Wi-Fi devices, without the need for batteries or electronics," says their paper. "To this end, we present a novel toolkit for wireless connectivity that can be integrated with 3D digital models and fabricated using commodity desktop 3D printers and commercially available plastic materials." A 3D-printed sensor picks up from an existing ambient Wi-Fi from any router and either absorbs or reflects signals from it to indicate zeroes or ones. A 3D-printed switch attaches to a spring and presses against it and makes contact with a 3D-printed antenna of conductive filament. When it does so, the signal is sent out to a receiver like a smartphone. Physical movement is turned into electronic data. The researchers give the example of a bottle of Tide detergent fluid to which one can attach a 3D-printed sensor. When the level of the fluid is running low, the sensor will be able to automatically order a refill on Amazon using a smartphone. The implications of being able to provide everyday things with connectivity are enormous. "Such a capability democratizes the vision of ubiquitous connectivity by enabling designers to download and use our computational modules, without requiring the engineering expertise to integrate radio chips and other electronics in their physical creations," says the paper. 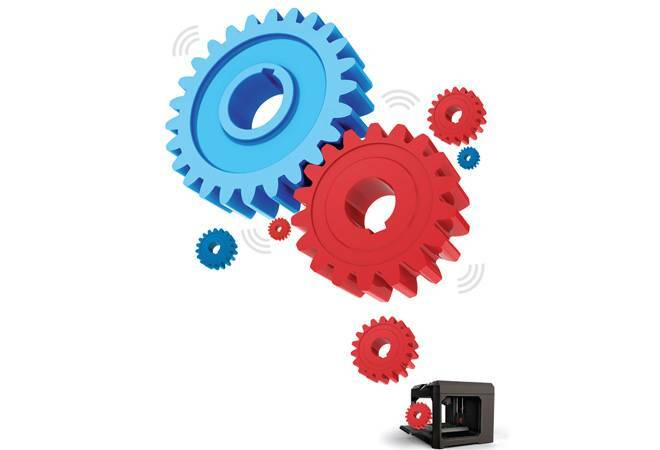 "Further, as the commoditization of 3D printers continues, such a communication capability opens up the potential for individuals to print highly customised wireless sensors, widgets and objects that are tailored to their individual needs and connected to the Internet ecosystem." Examples of what the research team created to demonstrate the technique included a wind meter, a water meter and a scale. These were made to connect to a device. The kit is available to anyone who has a 3D printer, materials and can design an object they can put to use - such as a slider that can adjust volume. A company called Umbrellium has set up an interactive crossing at Starling Cross in South London. While it uses familiar and understandable road markings and colours, the Starling Crossing reacts dynamically in real time to different conditions, and is able to modify the patterns, layout, confi guration, size and orientation of pedestrian crossings in order to prioritise pedestrian safety. The entire road surface at the crossing area is monitored by cameras and embedded with computercontrolled LEDs that can be seen from all angles, during both day and night. Using a neural network framework, cameras track objects moving across the road surface, distinguishing between pedestrians, cyclists and vehicles, calculating their precise locations, trajectories and velocities and anticipating where they may move to in the next moment. At different times of day, and in different situations, the road can alter its confi guration in real time. When there are fewer pedestrians, the crossing may only appear when people approach, guiding them to the crossing location that it has learned over time to be the safest, leaving the road otherwise free for vehicular traffic.